Small cartridge dust collectors are designed for small volume dust and fume extractions. Compared to large cartridge collectors, small cartridge collector features small size and easy installation. Most of the components have already been installed before delivery. What you have to do is to raise them up and connect the units with ducts and wires. This saves your purchase cost and installation time significantly. Where there is no compressed air available, these units can be delivered with built-in air compressors. Modular design and bolt assembling make prompt manufacturing and delivery. Compact structure to save floor space; Standard space requirement: 1200mm * 1800mm. Full automatic pulse jet clean system, top mounted fans, control cabinet are standard equipped with the dust collector. Special design deflector plates greatly reduce the dusts falling from top cartridges to down cartridges. Minimum installation required on site. All the components have been installed before delivery. The unit can run immediately after wired and ducted. 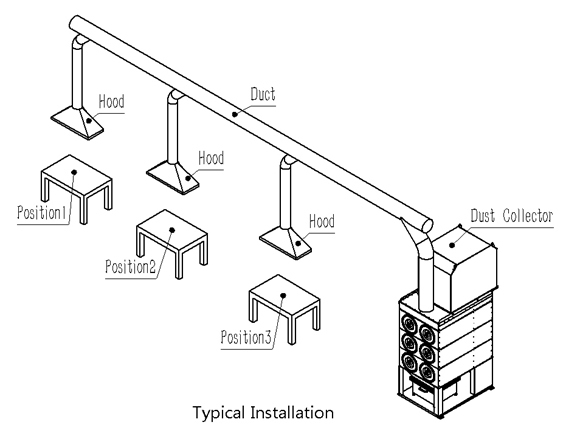 Optional fan acoustic chamber available to control the noise below 74dB. Optional built-in air compressor is available so that no external compressed air is required. Choose various types of filter media for various types of dust collections. Specially venturi and supersonic injection nozzles achieve the premium pulse cleaning on filters. The cartridge filters can be replaced from outside of dust collector. Easy and clean.